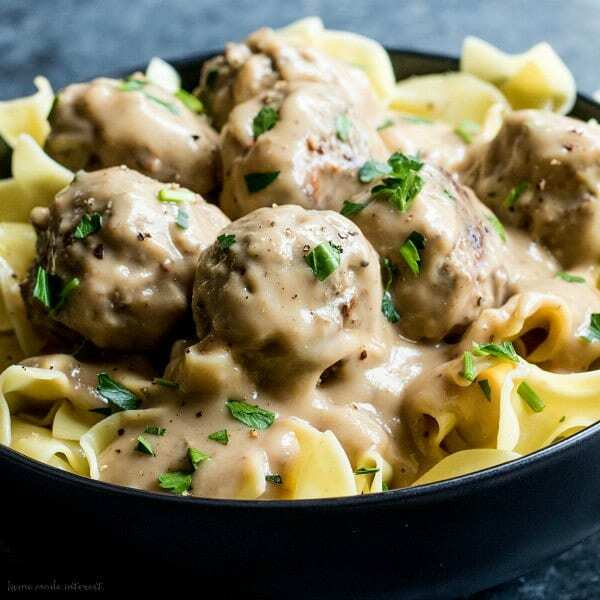 Easy Swedish Meatballs - Home. Made. Interest. 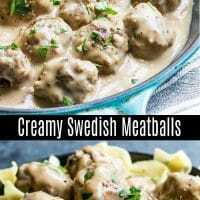 These Easy Swedish Meatballs are a traditional Swedish dish with flavorful homemade meatballs coated in a rich and creamy sauce. Classic comfort food served over noodles for a hearty dinner your family will love. 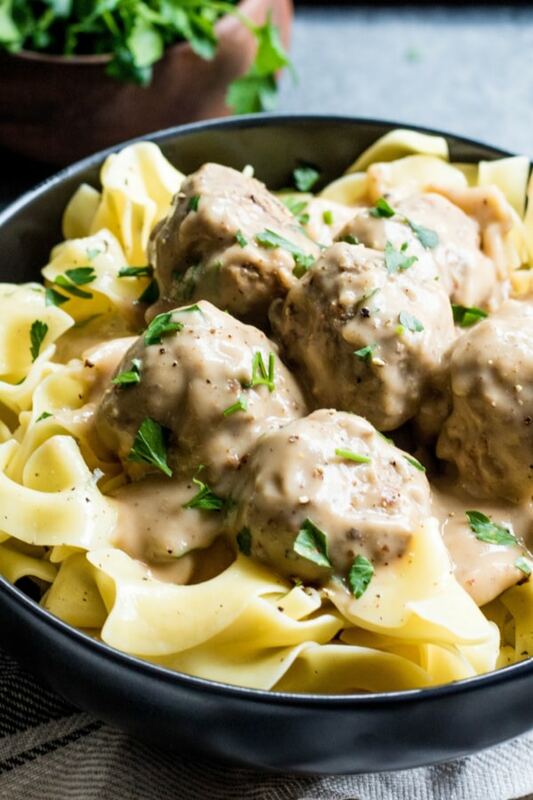 These easy Swedish Meatballs are comfort food at it’s finest and after today you won’t have to wait for your next trip to Ikea to enjoy them! The homemade meatballs are made with a mix of ground beef, ground pork, breadcrumbs, onions, and spices. It’s the spices that make these meatballs so different. Nutmeg and allspice are used to give the meatballs a sweet, spicy taste that sets them apart from your classic Italian meatball. In a large bowl combine ground pork, ground beef, onion, egg, salt, pepper, breadcrumbs, nutmeg, allspice, and parsley. Mix the ingredients thoroughly then roll into 1 1/2 inch balls. 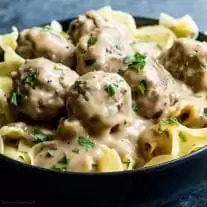 Place butter in a large skillet and, working in batches, begin frying the meatballs, cooking them on all sides until they are perfectly browned and cooked through, about 10 minutes. Once your meatballs are cooked it’s time to work on the sauce. Oh that sauce! It’s what dreams are made of. 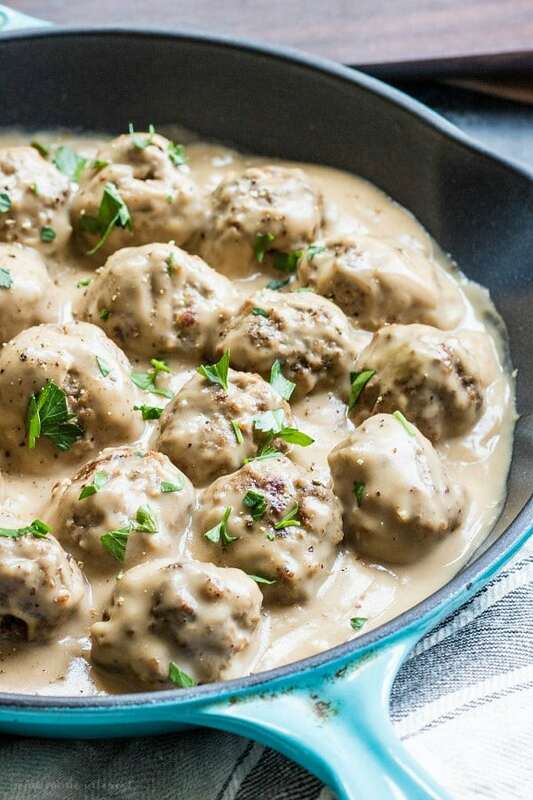 The creamy brown sauce served with Swedish Meatballs is similar to gravy. Beef broth is added to a roux and whisked slowly until it becomes a smooth sauce. Then you add a bit of Worcestershire to give it some added flavor, and heavy cream to turn it into a luscious, rich, sauce that you’re going to want to put on everything. Add your meatballs to it and let them cook in the sauce for a few minutes and you’re ready to serve. I suggest serving them over egg noodles or mashed potatoes. Yum! 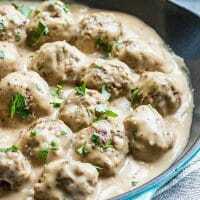 Once meatballs are cooked set them to the side and begin making your sauce. Add butter to the skillet and once it is melted add the flour whisking quickly and forming a roux. Cook for 1-2 minutes or until it begins to turn a golden color. Slowly add beef broth whisking the whole time to keep it from getting lumpy. Once all of the broth has been added cook for 5-7 minutes or until the sauce begins to thicken. Add Worcestershire and heavy cream and continue cooking until the sauce is thickened enough to coat the back of a spoon. Add the meatballs to the sauce and cook them together for about 5 minutes. 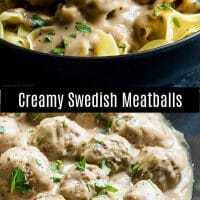 I highly recommend using a mixture of pork and beef for the meatballs but you can substitute with all beef if you prefer. The size of the meatball will affect how long you need to cook it so make sure you test one to ensure they are fully cooked. Don’t have beef broth? You can substitute chicken broth in the sauce. Like this recipe? Pin it to your Easy Dinner board! Note: If your skillet has too many burned bits after you finish cooking the meatballs you can wash it out before starting your sauce.